A few men are brave enough to carry the bright pink diaper bag or the purple baby carrier to a store. Some moms would jump for joy if the men would be more enthusiastic about helping with baby duty. Maybe it's all in the presentation. Mission Critical is making baby products with the male style in mind. This great giveaway is sponsored by Mission Critical and hosted by Mom Does Reviews and her best bloggy friends. Mission Critical has created the ultimate baby products for dad. They have diaper bags AND an amazing carrier too! One of Mom Does Reviews' readers said that there is nothing manlier than a strong man who babywears... well, I'd have to say that there is is nothing better than a strong man babywearing a little one in a carrier just as strong as he is. 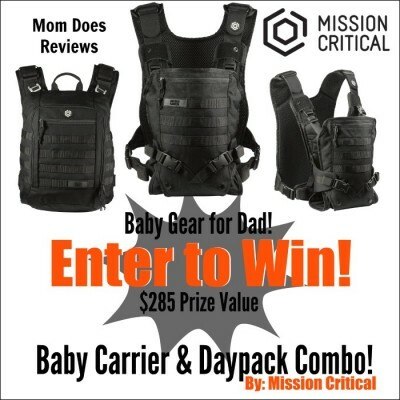 The Mission Critical Baby Carrier is a front carry baby carrier. Simple, intuitive design makes it easy to put on and secure your baby. Baby can face in or out, depending on their stage of development. It features a removable and washable liner, hidden hood, MOLLE straps for customization, and a unique secure vest design allowing full freedom of hands and mobility. (Shown with optional Carrier Daypack). In stock - ships same day. 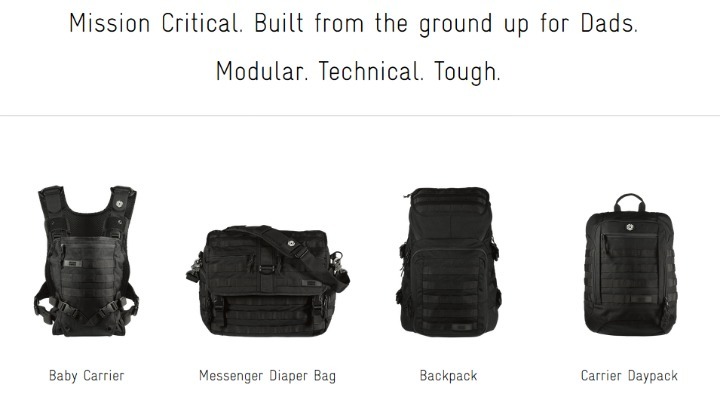 The Mission Critical Carrier Daypack is a versatile backpack custom designed to attach to the back of the Mission Critical Baby Carrier using the MOLLE system, or worn alone using the stowable shoulder straps. The Carrier Daypack features a side access changing pad and a large compartment with all the room needed for extra diapers, wipes, changes of clothes, snacks or whatever you may need. The Carrier Daypack also has the MOLLE system allowing any accessories you purchase to fit the M1 Carrier Daypack as well. Using the Carrier Daypack on the back of the Mission Critical Baby Carrier helps create an evenly distributed load making it easier to stand up straight. The Daypack really helps to keep weight distributed. Attach it quickly with the clips or securely with the MOLLE system. Mom can leave her diaper bag at home because dad will be able to carry everything on his own. You want to win a carrier and daypack right? Who wouldn't want to win this setup? Read Victoria's Review at Mom Does Reviews. Please wait for the rafflecopter to load. Make sure to come back daily to send your daily entries for more chances of winning. Giveaway is open to US only Ends 4/10 at 11:59pm EST. I like the Backpack the best. Now i have a information about lebenswert 1 . If you want to know about it so please join with us. Thank you so much.